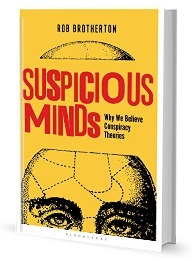 With colleagues at the University of Kent (Prof Karen Douglas and Dr Aleksandra Cichocka), we have written a piece in The Psychologist discussing conspiracy theories and the campaign to Leave the EU. In short, we have found that belief in such conspiracy theories predicts the extent to which people believe that Britain should remain part of the EU. Click here to read the piece in The Psychologists. This entry was posted in Social psychology, What's the harm, World events. Bookmark the permalink. “conspiracy theories, politically, are generally found in the realm of the right and not the left”. Really? Then how do one explain the Unabomber? He was leftwing but cooked up all kinds of crazy ideas that was leftwing. And what is the feminist idea of patriarchy if not a conspiracy of men to keep women down? White Privilege again is a conspiracy theory that suppose to explain how white people keep people of color down, but looking at Bollywood one never talk about Indian Privilege or in Japanese movies about Japanese Privilege. I agree that right wingers are sceptical to power, but as we now can see in USA leftwingers suspect the end of the days because of Trump winning the election and KKK is seen all over the place. Is not the idea that Leave were right-wing and Remain were a left-wing a gross oversimplification? I can think of many voices in the Green party and within Labour who supported Leave, and many right-wingers in the Conservatives who supported Remain. A more accurate bifurcation, in my opinion, would be that between globalism and nationalism. I dont think you have to be a conspiracy theorist to want to leave the EU. If you love your country then surely you are against it. They are taking away national borders and national laws and they are replacing them with EU rules. Cant be good. Hello,I log on to your blog named “Conspiracy theories and the campaign to Leave the EU | The Psychology of Conspiracy Theories” daily.Your writing style is awesome, keep it up! And you can look our website about love spells.